You are here: Home / Journal / What’s the longest you’ve had without showering? What’s the longest you’ve had without showering? 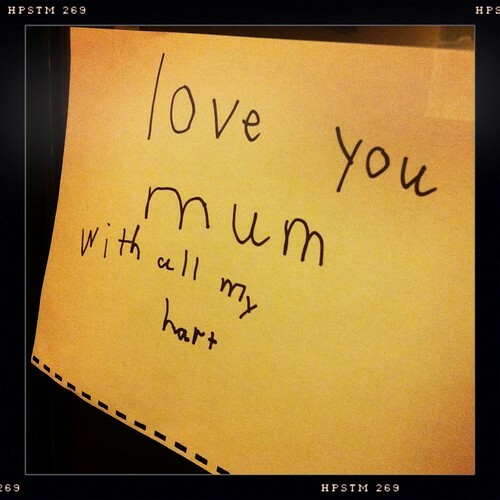 He’s got to do some work on his spelling as I’ve alluded to before here, but the sentiment and the love is all here (image above). After he gave me the note I stuck it on the glass of the dresser I have in the lounge, lopsided and all. And that’s the way it’s stayed. I can’t bring myself to take it down just yet. We went away camping on the weekend. It was a big celebration for a friend who’ll shortly be 50. On the main party night there were around 200 people attending from the local area and further afield. It was a four hour drive for us to get there so we stayed for four nights along with some others. That’s four nights without showering. I can live without a shower for a few days but I hate the way my hair feels. By the last day, it was dirty and greasy but I wore it down anyway. I had managed to get into the sea for a couple of swims while wearing a wetsuit as the water is nowhere near warm enough to not wear one. Even then it wasn’t that pleasant, but the feeling of very cool water after not much sleep and maybe a couple of drinks too many was worth it. The longest I’ve ever gone without a shower was six days. I went trekking in the Sanai Mountains in Egypt. This was 20 years ago so this website isn’t the company I went with. They wouldn’t have even had a website back then. I’ll never forget that trek. I’ll never forget doing my morning squat and then looking up to see Bedouins looking down on me. I’ll never forget sleeping out underneath the stars with the camels chewing their cud all night long. I’ll never forget the oldest member of our group (60) being the fittest of us all. But back to our four days of camping. When we got back from the weekend neither of us had enough time to shower before JJ had his first baseball practise. I just hope I didn’t smell too bad. After baseball practise we both had showers and put clean clothes on. JJ had been wearing the same pair of jeans, jocks and socks for the last five days. Well he may have had a change of underwear once during our time away. I still washed everthing, clean or not because even if things haven’t been worn when you’ve been camping it still stinks, and looks dirty. I, on the other hand, do change my underwear every day even when not showering. And no, it doesn’t mean turning it inside out. There will be more to come from the weekend away after I sort through all my photos. I haven’t had time to even remove the SD card from the camera.